Red cabbage slow braised with vinegar, served warm with a couple of German brats and slathered in a good brown mustard...wait a minute, wrong menu. 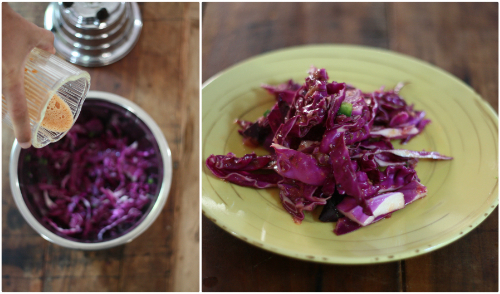 Taking the base inspiration from this Red Cabbage Slaw recipe, I had to add a little spice and E.A.T. 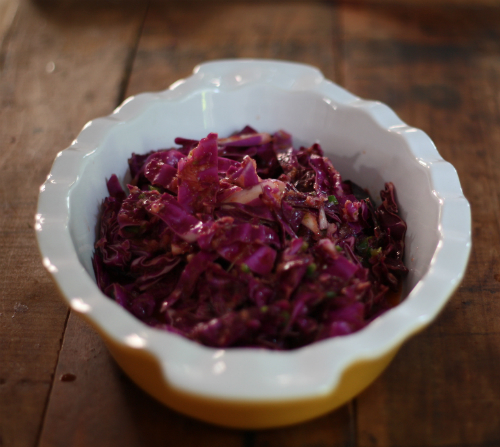 flair — the flavors in the summer slaw are incredible. 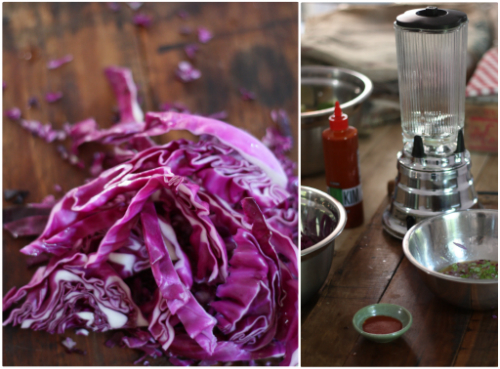 Add all of the of the ingredients except for jalapeno and red cabbage into a vintage blender (vintage blender optional) until smooth, adding the KIMKIM last. 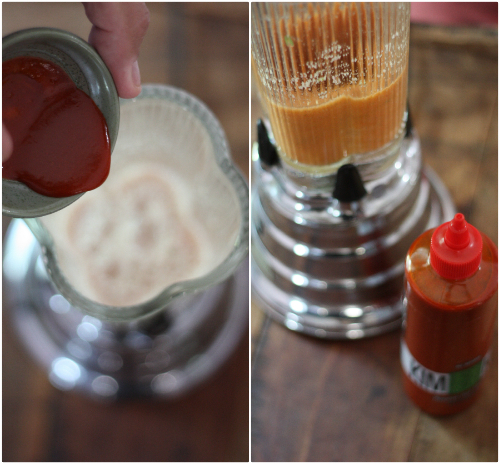 Finishing the mixture with the KIMKIM will create an orange peachy color you will be dying to taste. 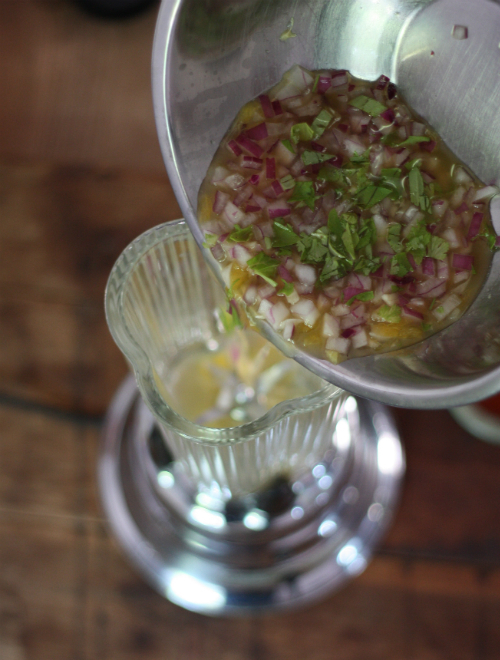 Pour this fresh dressing over the hand-cut cabbage and jalapenos, tossing to coat. 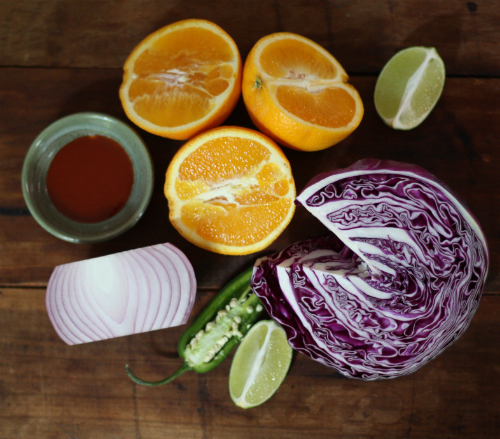 This slaw is perfect alone or would be an amazing addition to fish tacos, pulled pork barbecue or as a side to jerk chicken! Cabbage is a seasonal spring and fall vegetable — get yours now while fresh and in the height of the season. Tasted KIMKIM sauce the other day and totally fell in love with it. I bet it's just perfect for a light cabbage dish like this. Yes Kendra a new must have condiment in the fridge! Oooooh! I am going to make next time I make pulled pork. I bet it would go great with hamburgers too. I had not thought of hamburgers but that would totally work! We don't have KIMKIM sauce here - I looked it up. What could be a reasonable substitute? I imagine Sriracha is too hot. Sriracha would be fine to use just cut it with a little white vinegar to tone it down a bit. Hopefully KIMKIM wil be available through mail order soon. 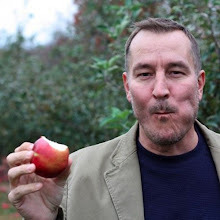 KIMKIM has a lot more flavor and a hint of bite. Thanks for stopping by. There is a Fresh Market across the street from my office and I hear that it will be at Fresh Markets soon. I hope mine is one of them! I'm in Baltimore. Nice, I am actually going to stop in Baltimore Sunday to see the Phillies play the O's on my way to NYC next week. Let me know if you are headed to the game and I will bring a bottle up! I am actually going to watch my friend brew beer that day but such a sweet offer!